Early in May, Mr. Fairbairn, who was not in good health, notified the Committee that he could not continue the coaching of the crew. The Secretary of the Board, Major Middleton, whose duties were multifarious, found time — or, rather, made time to go to the river from his office each morning and carry on the coaching. He carried on for three or four weeks, and then the services of Lieut.-Col. Norman Marshall, D.S.O., M.C., were made available by the A.I.F. authorities in France, and he arrived and took over the work. Arrangements were made with the Thames Club for the hire of the Australian boat "Q.L. Deloitte," which had been used by the successful Australian crew in 1912 at Henley, and a second eight was hired from Jesus College, Cambridge. Practice oars were bought from Norris, of Putney, and racing oars from Ayling. Rowing on the tidal waters of the Thames at Putney is not always pleasant. The 23 ft. drop of tide means a fast-running stream and, more often than not, rough water. That being the case, the crew welcomed the suggestion of an early move to the more sheltered reaches of Henley. Arrangements were made for the hire of a fine residence on the riverside — Wharfe House — near the finishing mark of the Henley Course. The general advice was all against this early move, owing to the belief that crews "go stale" there easily and quickly. However, it was decided to do the last month's training there, and a move was made on June 1st. The bulk of the rowing party was given a few days' leave, and only those necessary for shifting house were kept. Boats were carted by road to their new home, and the goods and chattels taken by motor-lorry to "the better 'ole." When the A.I.F. men arrived they found that the American crew had already been in training at Henley for a fortnight. Apart from the fact that there was no speed launch available for the use of the coaches — coaching had to be done from the tow-path on bicycles — the move up-river was very beneficial. Training continued under ideal conditions as to accommodation and rationing. Wharfe House was in every way suitable for the purpose to which it was put. A fine lawn sloped down to the bank of the river, where a pontoon allowed for the safe launching of the boats. A small shed an one side of the lawn housed the boats and gear of the party, and the surroundings of green trees and lawn, and the placid surface of the river, very soon had a good effect on the crews. In addition, Wharfe House was a fine vantage point from which to view the work of the crews. 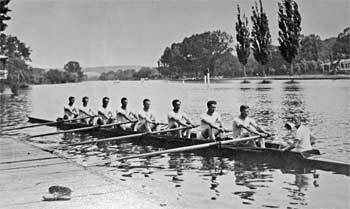 The chief event on the long Henley programme was the eight oar race for the Allied Forces. His Majesty King George V. presented a handsome Cup for the winners of this race. 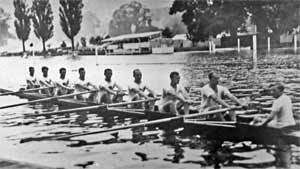 Other events open to Service men were the Coxwainless Fours, Sculls and Pairs, the two last-named events being open also to members of affiliated clubs. There was a second race for eights — the Fawley Cup. The conditions for this event were not quite clear, and an inquiry was made of the Regatta Secretary as to whether an Australian crew might be entered. His reply was in the affirmative, and the A.I.F. No. 2 Crew was entered. However, the Regatta Committee subsequently decided that the crew was not eligible. This was unfortunate, as the Rowing Sub-Committee had been influenced on deciding on entering a second eight for the Regatta by the belief that it would be eligible for this event. This course had been taken in preference to that of making entries for the Coxwainless Fours and Pairs, and it was proposed then to enter only one eight for the King's Cup. The advantage of having a second eight was that the first crew had another against which it could try out. Then, again, coxwainless rowing is practically unknown in Australia, and it was thought wiser to adhere to the advice, "Better the devil you know than the devil you don't know." All these considerations, therefore, influenced the Committee in deciding in favour of two eights, and the refusal of the entry of the No. 2 Crew for the Fawley Cup created an unexpected position. No. 2 Crew had been entered for the Marlow regatta which was field a fortnight before Henley. The New Zealand crew had also entered for this event, and the race held a good deal of interest in that it would give an idea of the New Zealander's form. Prior to this regatta, and while the No. 2 Crew was finishing its preparations, Nos. 1 and 2 Crews had several bursts off the mark together, and rows of one minute's duration. In all of these the second crew proved the faster. Up to a certain point this was to be expected, as No. 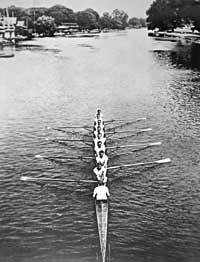 2 Crew was further advanced in its training, having been rowing twice a day for some time, while No. 1 with still a fortnight to go before Henley, had only commenced the daily second row, the danger of "staleness" being always present. As a matter of fact, the Selection Committee had discussed the matter of making several changes in No. 1 Crew prior to the trials with No. 2 Crew, but decided to leave the latter combination undisturbed until after the Marlow event had been rowed. After that it was decided that a full course trial should take place between the two crews.